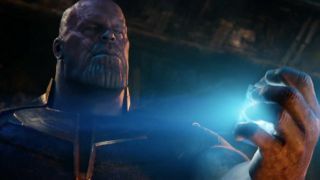 In a Q&A at Iowa City High School (via TheRealStanLee.com), the elder Russo brother delved into a big debate over whether – massive spoilers here, last chance – Gamora was still contained within the Soul Stone at the conclusion of Infinity War. Thanos, if you remember through all of your tears, goes face-to-face with a younger Gamora upon snapping his fingers and wiping out half of the universe. But that’s not even close to the coolest part. That would be the fact that Gamora is still alive inside the Soul Stone. No, this is not a drill. Read on if you want to get to grips with the Avengers: Infinity War ending - and the rest of the movie's mysteries.